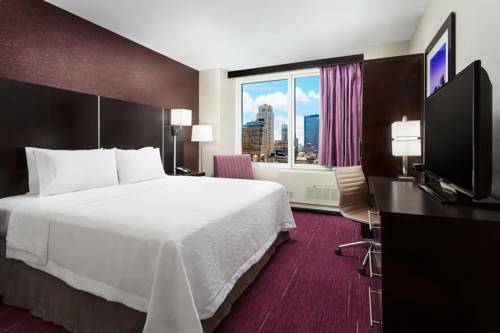 At Hampton Inn Manhattan/Time Square Central you*ll be in the heart of the vibrant Times Square/Broadway area of Manhattan close to theaters shopping and dining. Enjoy easy access to the Port Authority Bus Terminal Penn Station and subway lines that will take you to other areas of Manhattan and the boroughs. Walk to Rockefeller Center Herald Square Jacob Javits Convention Center and Madison Square Garden. After a busy day at meetings or exploring Manhattan retire to a comfortable guest room and relax in a clean and fresh Hampton bed. Check emails using free WiFi at the spacious work space. Store your valuables in an in-room laptop-sized safe. Unwind watching your favorite programs on the 40-inch flat-screen TV. If you*re bringing your family request a high chair or crib for a more comfortable stay. Before beginning your Manhattan adventure each day visit the lobby for our free hot breakfast which includes delicious freshly baked waffles hot and cold items juices and coffee. Maintain your exercise routine in the modern fitness center with cardio and weight equipment. Hold a meeting in our 425 sq. ft. boardroom and do any last-minute preparations in the business center. Visit our convenience shop to pick up a snack pre-packaged meal drink or a necessity you left at home. Reservations must be canceled 24 hours prior to arrival to avoid penalty. Policy is subject to change. Built for group feasting these fast-paced Italians offer whirlwind experiences in family-style dining via large platters. Overall great taste and value. Great burgers fish tacos salads hot dogs and amazing sandwiches It*s a menu with an array of foods that everyone loves to eat. Sophisticated space with an old-world vibe dispensing pints alongside Irish - American dishes. Upscale steakhouse recognized for its perfectly prepared 28-day dry-aged steak.